I was the best man for Charlie, so wanted an activity for his stag weekend in Brighton (East Sussex) in February 2013. After talking with the other lads on the pre-stag do (just another excuse for a night out in the pub for purely planning and bonding purposes ! ), we chose clay pigeon shooting to do on the Saturday afternoon. This was mainly to offset the pasta making cooking class booked in on the Sunday, which some guys wanted to balance with something a bit more macho. There were 10 of us, so I booked a minibus for £80 return with Richard’s Minibuses. From outside the central apartment we stayed at, it took 20 mins to get to the farm just outside Brighton, but probably another 20 minutes to drive through the farm and out to the remote location where they did the shooting. The track is really bumpy and slightly off-road. So if you all decide to drive, don’t risk it in any car with a low profile, as you might lose your exhaust! We paid £30 each for 25 clays with Clays 4 U which are the supplier rather than an agency. On arrival we huddled in the portakabin to stay warm, then the group split into 2 groups of 5. There were 2 shooting spots set up; one where the clays fire away and up, and one where the clays fire from left to right. So each scenario needed different techniques for tracking and shooting the clay. In the group of 5, we had a scoring sheet, and shot 13 clays for the away and up clay shoot. There was surprisingly no real health & safety or group briefing; the instructor just gave the gun to one of us, and started coaching each shooter on a 1:2:1 basis. He loaded the shot cartridges, and when the shooter said “pull”, pressed a remote which released the clay. stag looking even more of a knob with a gun in his hands – yet another photo for the best man speech – yay! We then moved onto the 2nd left to right scenario for our remaining 12 clays, swapping with the other half of the group. In the end, 3 of the guys came out with equal scores, so they had a shoot off with sudden death when someone missed – it was a nice way to end the activity with an overall winner, and all in all it lasted just over an hour. Dress up warm as you’ll be in the middle of a field with little shelter from elements. There is no toilet, so you might want to “lighten the load” back at base in Brighton. 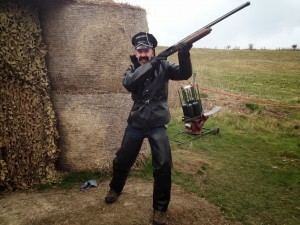 Get the stag dressed up – looks even more of a t@sser in fancy dress AND with a gun in his hand ! Overall, we all thought it was a great activity. It got us out of Brighton and put some much needed East Sussex fresh air into our lungs. It did also break up the drinking a bit, and got quietly competitive – everything went quiet when the guy was giving out tips to the shooter! Definitely a solid 8 out of 10, if not 9. 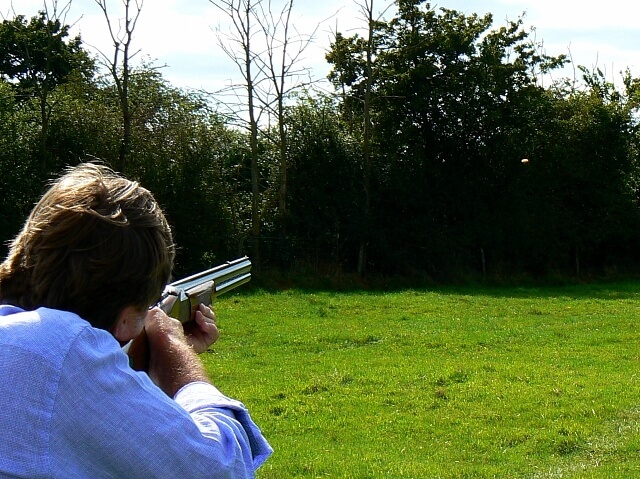 Have you ever done clay pigeon shooting on a stag? Did you think it was good, bad, terrible, what? Let us know in comments below, especially if you think my shooting tips need improving on! Cheers. We always give a safety brief,which includes shooting advice before shooting commences. I cannot understand how this could have been not done on your day. Did you meet me on your day? You greeted us, John, and took one of the groups who were shooting. The shooting was great, including the advice on best way to use the shotgun.